There are many agricultural pesticides that require respirators, and selection of the correct respirator can be complicated. This guide highlights respirator selection for products that we expect to see widespread use of this year. *The University of Minnesota does not endorse or discourage use of the products highlighted. They have been chosen for educational use only. Who needs to wear a respirator with these products? What is a NIOSH-approved respirator with any R, P, or HE filter? *Under the Worker Protection Standards, respirator filters must be replaced every 8 hours. The filtering facepieces above (A&B) do not have re-usable filters, and thus would need to be disposed of and replaced after a full day’s work. The half and full-face respirators have filters that can be removed and replaced every 8 hours; the elastomeric piece can be washed and reused. *Read the labeling to determine how long the filter is resistant to oil. Under WPS, you are required to change your filters every 8 hours, but the manufacturer may specify more frequent change-out based on how quickly the filter degrades with oil exposure. The “HE” filters referred to on these labels refers to a filter that is at least 99.97% efficient at moving monodisperse particles of 0.3 micrometers in diameter. These filters are often associated with powered air purifying respirators. These respirators work in the same way that other filtering respirators do, but have an attached motor to help pump air into the respirator. Powered air purifying respirators are a good option for individuals with high blood pressure or difficulty breathing. Since they pump air into the respirator, the user’s lungs do not have to work as hard. However, these devices are more expensive than other filtering respirators. All major respirator distributors have most of the options listed above. An easy way to find what you’re looking for is to type “R99” “P100” “P95”, etc. into the search bar. 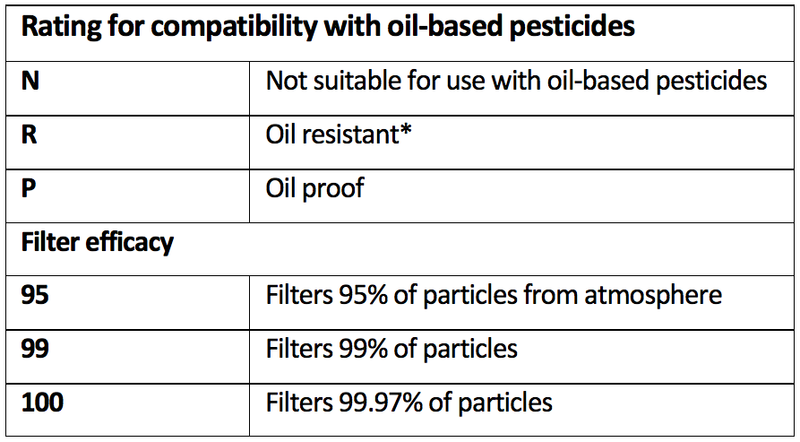 If you can find the correct filter, the description will usually list corresponding respirators that it fits into. Some examples of distributors that sell respirators are: Grainger, Gemplers, Northern Safety & Industrial, and PK Safety. The University of Minnesota does not endorse any of the following, they are simply examples of where respirators can be found. In addition to filtering respirators, there are respirators that absorb and adsorb gases and vapors. This type of respirator has a chemical cartridge or canister, and is not needed for these two products. *If you plan to wear a respirator, you must be fit tested to ensure that your respirator fits your face and will protect you. You must also have medical clearance to wear a respirator before you can be fit tested. TC stands for Testing and Certification. 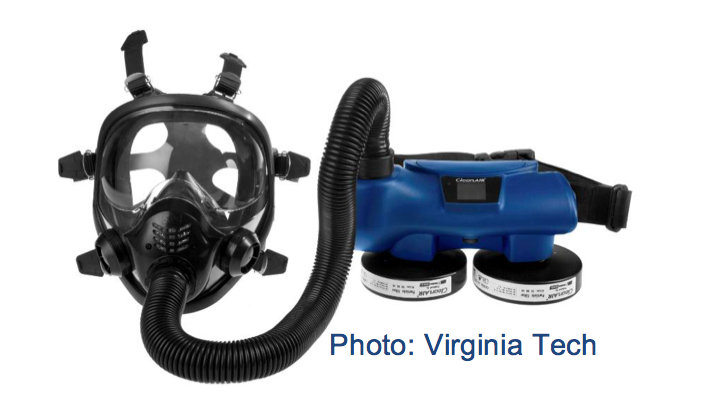 NIOSH uses this system to define groups of respirators. The two TC codes provided above correspond to the following types of respirators, according to NIOSH. However, EPA’s label review manual is catching up to the updated respirator standards and codes. Therefore, it is typically more reliable to follow the protection levels as guidelines for buying a respirator (i.e. “N95” or “R100”).